The Ilot Vache restaurant is on the corner of the Rue St.Louis en l’Ile and the Rue des Deux Ponts, which more or less bisects the Ile St. Louis into east and west halves. The Ile St. Louis was once actually two separate islands, one of which was the Ilot Vache (little cow island) because it was used as pastureland for Parisian cows. With the rapid growth of the city’s population in the 15th century, there was such a demand for more prime real estate that the two islands were merged into one and developed as residential space. Thus the name of the restaurant. The Rue des Deux Ponts roughly demarcates where the two islands were split. 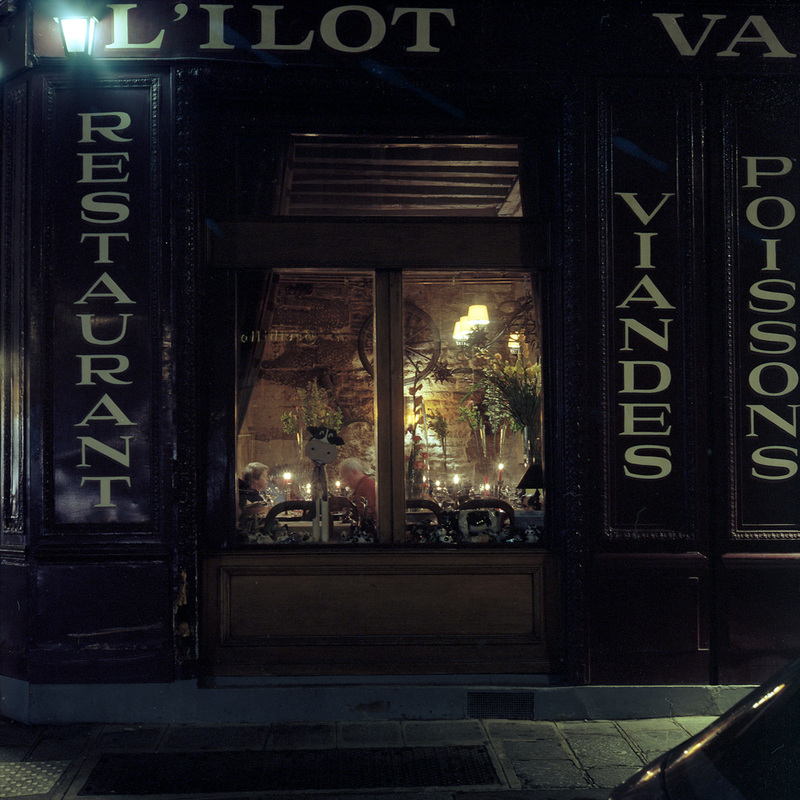 My dad and I ate dinner at L’Ilot Vache one night, and the food was quite good, even if the dining room was a bit crowded. I managed to catch a pair of diners in the window of the restaurant. 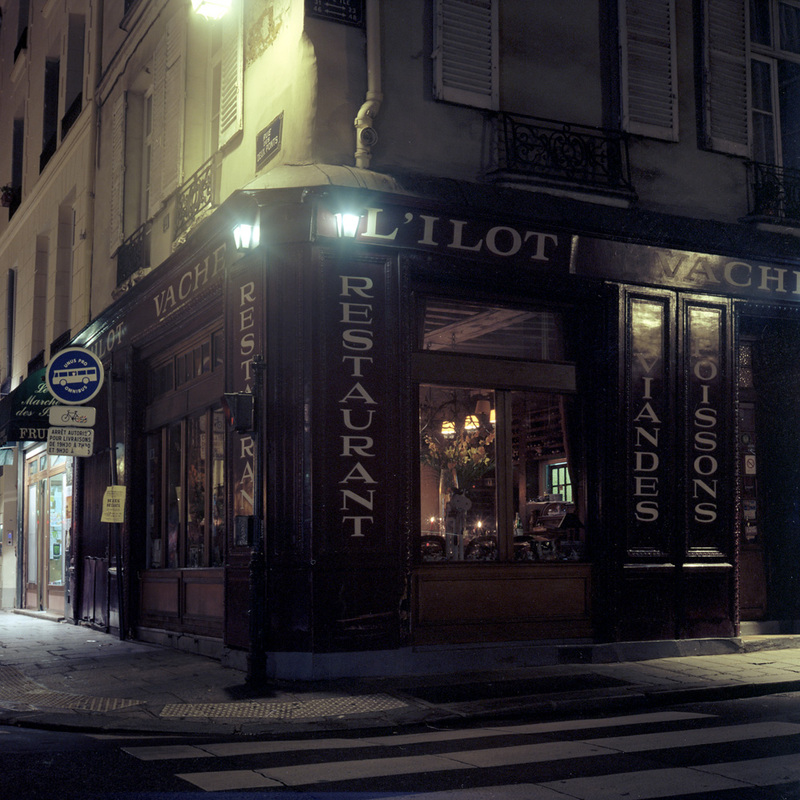 This is one case where I broke my normal rule of shooting night photos with Portra 160 – these two were done on Ektar 100. I suspect that I had just a couple frames left on the roll of Ektar that was loaded in the camera when I set out to do my night shots, so I finished them off and then switched over to Portra for the rest of the evening.